Lynsey de Paul was an English singer-songwriter. She had chart hits in the UK and Europe in the 1970s, starting with the UK top 10 single "Sugar Me", becoming the first British female artist to achieve a number one with a self-written song. She represented the UK in the Eurovision Song Contest, scoring another chart topping hit in Switzerland and had a successful career as an Ivor Novello Award-winning composer, record producer, actress and television celebrity. "Won't Somebody Dance with Me" is a song written by Lynsey de Paul in 1973, which was awarded an Ivor Novello Award in 1974. Her original version of the ballad made the UK, Irish and Dutch Top 20s, and the song was featured in Michael Winner's remake of the film The Big Sleep, The Muppet Show, and the 1970s version of the New Mickey Mouse Club. Sir Maurice Arthur Eric Hodgson was chairman of ICI from 1978–1982, and of British Home Stores from 1982-1987 and chief executive from 1982-1985. Fyodor Fyodorovich Bogdanovsky was a Russian weightlifter. Between 1954 and 1959 he won an Olympic gold medal, four European titles, and five silver medals at world championships, losing to either Pete George or Tommy Kono. He set eight ratified world records, five in the press and three in the total. Pierre André Buffière was a French basketball player and coach. He was born in Vion, Ardèche. He was awarded the Glory of Sport in 1995. He was inducted into the French Basketball Hall of Fame, in 2004. Lieutenant-Colonel Michael Jaffray Hynman Allenby, 3rd Viscount Allenby of Megiddo was a British politician and hereditary peer. Peer Augustinski was a German actor and voice actor from Berlin. He was best known as a cast member of Klimbim, one of the first successful comedy shows in Germany, and as the official German dub-over artist of Robin Williams. With the exception of The Peddler in Aladdin, Augustinski dubbed all of Williams' film and television roles from late 1986 to 2004. 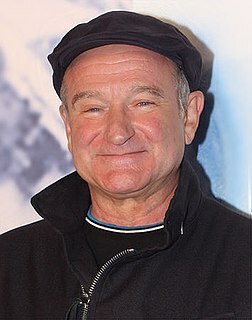 Robin McLaurin Williams was an American actor and comedian. Born in Chicago, Williams began performing stand-up comedy in San Francisco and Los Angeles in the mid-1970s. He is credited with leading San Francisco's comedy renaissance. After rising to fame playing the alien Mork in the sitcom Mork & Mindy, Williams established a career in both stand-up comedy and feature film acting. He was known for his improvisation skills and the wide variety of memorable character voices he created. Williams has been called the funniest person of all time. Konrad Boehmer was a German-Dutch composer, educator, and writer. Hugo Carvana was a Brazilian film and television actor. He had appeared in 65 films since 1955. Entranced Earth is a 1967 Brazilian Cinema Novo drama film directed by Glauber Rocha. It was shot in Parque Lage and at the Municipal Theatre of Rio de Janeiro. The film is an allegory for the history of Brazil in the period 1960–66. John Best was an American international soccer defender. He spent six seasons in the North American Soccer League where he was a five time first team All Star. He later coached the NASL Seattle Sounders and served as the general manager of the Sounders and the Vancouver Whitecaps. He also earned one cap with the U.S. national team in 1973. Albert P. "Al" Bruno was a gridiron football player, administrator, and coach who served as the head coach of the Hamilton Tiger-Cats from 1983 to 1990. The Canadian Football League is a professional sports league in Canada. The CFL is the highest level of competition in Canadian football. The league consists of nine teams, each located in a city in Canada. They are divided into two divisions: four teams in the East Division and five teams in the West Division. Lucio Sangermano, 82, Italian Olympic sprinter. Nedo Logli, 91, Italian cyclist. ↑ Bishop João Corso, S.D.B. ↑ "R.I.P. Agent Orange Bassist James Levesque". Archived from the original on 2015-10-16. Retrieved 2014-11-07. ↑ "War criminal Golam Azam dies". Archived from the original on 2014-10-25. Retrieved 2014-11-07. ↑ Obit: Clarence “Bud” Addison Brimmer, Jr.
↑ "49ers Legend Gordy Soltau Passes Away". Archived from the original on 2016-03-04. Retrieved 2014-11-07. ↑ MACKAY, Dr. J. Ross O.C., F.R.S.C.